Burning Man’s temporary metropolis has always looked like a settlement from the world of Mad Max, but it appears some of this year’s revelers have channeled the Hollywood movie’s dystopian baddies by attacking a luxury campsite at the festival. Some 70,000 people descended on the Black Rock City, the site for the cavalcade music and artistry that pops up once a year amidst the otherworldly landscape of the Nevada desert. However, a small number of festival goers have been accused of targeting a campsite known for its celebrity attendees, “white party” and techno soundtrack. The self-proclaimed festival of “radical self-expression” began on August 28 and will draw to a close with the burning of a 100-foot tall temple designed by architect David Best. Saturday saw the burning of a design replicating Leonardo Da Vinci’s Rennaisance Man, which is part of the festival’s theme this year. Fire tornadoes, sunrise, and the burning of the pyramids #epicburn #epicnight #epic #dustmonkeys #burningman #l4l #beautiful picture by Jon Wong!! While many people have posted about their enjoyment at the weeklong excursion in the desert, it has emerged that organizers of the White Ocean campsite - described as a “plug and play” area – haven’t had as much fun. “A band of hooligans raided our camp, stole from us, pulled and sliced all of our electrical lines – leaving us with no refrigeration and wasting our food and glued our trailer doors shut, vandalized most our camping infrastructure,” the White Ocean official Facebook page said. Set up by DJs and entrepreneur Timur Sardarov, the White Ocean digs are favored by celebrities and have been criticized for not being in the spirit of the “radical inclusion” and “decommodification” event. However, a White Ocean spokesperson has rejected any suggestion that the Burning Man “utopia” camp is exclusionary. “We provide one of the most state-of-the-art stages on the playa and feed hundreds of non-white ocean burners a day. Does this qualify as a non-welcoming camp with no contribution to Burning Man? Meanwhile, participants have been gearing up for one of the weekend’s main events – the lighting of the temple – which begins at 8pm local time and which you can follow on RT’s livestream of the event. It sees festival goers leave tributes to loved ones, personalized messages or wall etchings before the wooden structure goes up in a flurry of flames. “The temple is at the edge of where we bring order to chaos. 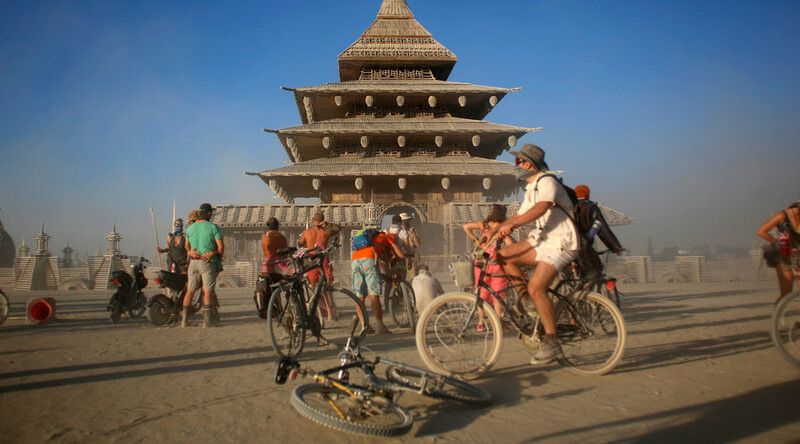 It is where our community goes to unburden themselves,” the Burning Man website states. This year David Best has designed the famed structure in the style of a Nepalese place of worship.